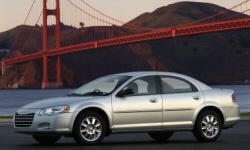 Chrysler Sebring Pros and Cons | Page 1 of 1 | Why Not This Car? What drives people to buy (or not buy) a certain car? TrueDelta's members share Chrysler Sebring pros and cons based on their real-world driving experiences. A less than one year old mid-size, mide-level trim sedan at $13,695 with only 12k miles was an absolute steal. Priced lower than compact cars. The Sebring convertible is a midsize car that feels like a big car; that is, it is solid and comfortable. But the gas milage is good. All in all, it is a joy to drive, with many thoughtful features--at least in the model I own, a 2004 Limited. Sleek and modern looking. The top hides completely when lowered. Excellent mileage for a car that will hold four with lots of room, about 30-34 mpg at freeway speeds. The 4 cylinder engine is not a hot rod but gets up to highway speed without making me feel nervous about merging. very comfortable for my "football player" frame of 6ft 230lbs - lots of room to stretch out as well as hip and shoulder room. I liked that the interior had a very light tone - a pleasant change from most other vehicles which come with a dark grey to black tone. I liked the driving position and the positioning/actuation of the buttons. My previous experience with the Chrysler dealership has been wonderful. They always were quick to fix the latest rattle or part failure. The extended warranty has proven to be a great investment. The Car, doup in a dark metallic blue, with alloy wheels was very attactive.